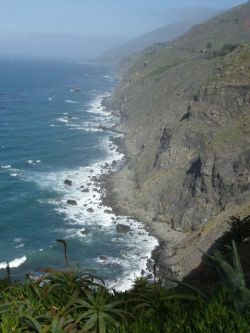 The Cliffs at Ragged PointI seem to have a preoccupation with cliffs, both in fiction and in my everyday life. In Love in the Present Tense, Leonard launches his home-built hang glider off one. In The Day I Killed James, James drives his motorcycle off another. I quit my day job and became a writer. Sounds like a one-time jump, but nothing could be further from the truth. This morning I took a good look at my appointment book for the rest of the year. It’s a lot different from last year, because of my landmark (for me, anyway) decision to stop traveling and speaking on behalf of the Pay It Forward concept. I had three more events that had already been scheduled for this year, and of course I need to follow through. Number one I just completed last week in Wichita. Two and three are in Oregon at the end of this month. Then...well, it’s something I haven’t seen for as long as I can remember. Empty pages. Whole months of empty pages. There are a couple of wonderful RV trips, and a friend’s wedding. A haircut and a dentist appointment. And writing time. It’s like the pleasant dreams I used to have when I was extra busy. Why is that akin to jumping off a cliff? Because public speaking has been a great supplementary income for me in recent years. This new move assumes that, in a very bad economy, I can continue to make my living as a writer. In case you think I’m rich. not so much. I’m okay for the moment, but not rich. I seem to be in the midst of an odd phenomenon that’s taken me years to figure out. There’s a disparity between my name recognition and my book sales. Chalk it up to Pay It Forward once again. It just isn’t like any other book. Most writers (I think, but I’m only me) who have a book that well-known become well-known as writers. The people who loved that book are into books. It seems to translate well to the sale of other titles by that same author. Millions of people who love Pay It Forward (definitely not all, but many) don’t like books, don’t read, and in many cases haven’t even read Pay It Forward. When they ask me to come speak, it’s not as a writer, but as an expert on social change. Which, by the way, I’m not. I’m just a writer. I’m not complaining. Just speaking to why I’m no longer doing it. Years ago my mother said something to me (it was a quote, but we’re not sure by whom) that changed everything in my life. She said the trouble with a fall-back position is that you tend to fall back. So when I decided to become a writer, I did not dip one toe into the water. I leaped off that cliff. There was no Plan B. Then years later I found myself at the edge of another cliff. Oddly, Pay It Forward had become my Plan B. If book sales on the newer titles were not enough to live on, maybe I could just make a living talking about the Pay It Forward concept. It would be something to fall back on. Then again, so would nursing or plumbing, but what happened to the “I am going to be a writer and there is no Plan B” idea? Besides, how do I know if I can make a true success of the newer titles if I continue to put barely half of my energy into them? So here I go again. Poised on the cliff of an appointment book with almost nothing it in. Ready to leap into the void.